Krishnapatnam Port in Andhra Pradesh,India is getting ready for commercial operations this month. The port is expected to be inaugurated on July 17. 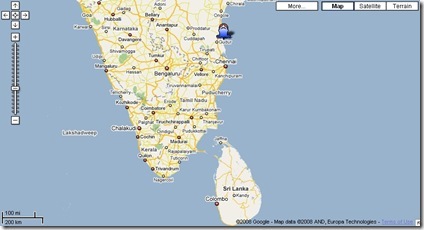 Located on the east coast of India in Nellore district of Andhra Pradesh,180 km north of Chennai. Operated by Krishnapatnam Port Company Ltd on a 50 year BOST (build-operate-share-transfer) contract awarded by the Andhra Pradesh government. To become the country’s largest private port by 2020 with a cargo capacity of 125 million tonnes per annum. by road to the National Highway-5 through state highway. by railway line connecting Chennai-Howrah broad gauge near Venkatachalam. Six helipads are also available. Deep Draft – Designed for handling vessels up to 200,000 DWT along side, in phases. Phase-1 Draft : 15.6 metres along side. Phase-2 Draft : 16 metres along side. Phase-3 Draft : 19 metres along side. Phase I implementation completed: 4 berths – each of 300 metres of length. Phase II expansion to commence in August 2008 will add 7 more berths. With final phase of expansion, Krishnapatnam port will have a total no of 41 berths with a quay length of 12.5 km and a draft of 19 metres. Here is the location map. United Progressive Alliance Chairperson and All India Congress Committee (AICC) President Sonia Gandhi on July 17 inaugurated the Krishnapatnam port. Read more from The Hindu. The KPCL has set its eyes on becoming a gateway to the Asia-Pacific and Far East Asian countries. Read more from The Hindu Business Line.